Family is everything for Dave and Lynne Lister, the founders of property search franchise X-Press Legal Services, which they launched to work together along with their children. And although franchising wasn’t a desire for Lynne, the network is almost at full capacity. Similarly, Michele Pernetta didn’t plan to leave her fashion career to make her yoga side hustle a permanent gig. But years later and her venture Fierce Grace has a presence globally. Women in franchising don’t always have it easy though, as we heard first hand from female franchisors. Indeed, Sounds Right founder Charlie Day declares: “Feminism is about women having equal chances and equal rights within business and franchising.” Elsewhere, cover star Martin Jones made the choice to change his life when his father became ill. 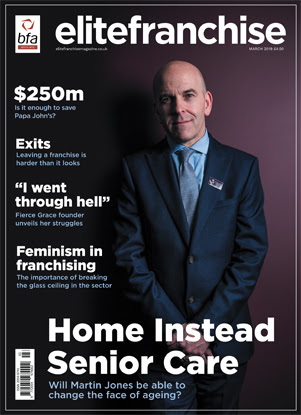 It resulted in Jones being named Home Instead Senior Care UK managing director, which is on the way to hit 200 franchisees.